What's a Labor Day Celebration without a freshly baked apple pie? While the weather doesn't look like it will cooperate for apple picking this weekend, there are still plenty of homegrown apples available in the Country Store. This recipe came from the new Eckert Family Fall Cookbook (available end of September!) - it is one of the Eckert Family's Favorite Recipes - Enjoy it with your family too! Directions:Preheat oven to 450 degrees F. Arrange apples in bottom of pie shell. Mix 1/2 cup of the sugar with cinnamon; sprinkle over apples. Mix remaining 1/2 cup sugar and the flour in small bowl; cut in butter with pastry blender or two knives until mixture forms pea-sized crumbs. Sprinkle over apple mixture. Bake 10 minutes. 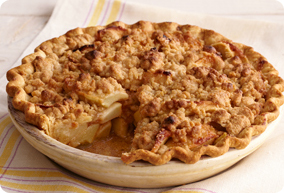 Reduce oven temperature to 350 degrees F and bake and additional 30 minutes or until apples are tender. From Our KitchenThe Eckert Family "secret" to the best tasting apple pie is to use a ratio of 4 Jonathan apples for every Golden Delicious apple.